Is a pretty lie better than the ugly truth? 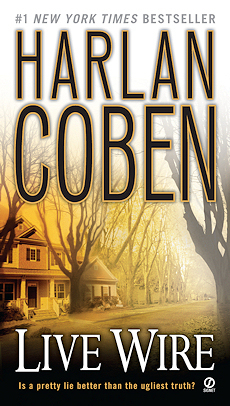 Harlan Coben published his first Myron Bolitar thriller, Deal Breaker, in 1995, introducing a hero that would captivate millions. Over the years we have watched Myron walk a tight rope between sports agent, friend, problem solver and private eye, his big heart quick to defend his client’s interests so fiercely that he can’t help but jump in to save them, no matter the cost. When former tennis star Suzze T and her rock star husband, Lex, encounter an anonymous Facebook post questioning the paternity of their unborn child, Lex runs off, and Suzze – at eight months pregnant – asks Myron to save her marriage, and perhaps her husband’s life. But when he finds Lex, he also finds someone he wasn’t looking for: his sister-in-law, Kitty, who along with Myron’s brother abandoned the Bolitar family long ago. As Myron races to locate his missing brother while their father clings to life, he must face the lies that led to the estrangement – including the ones told by Myron himself. If we thought we knew Myron Bolitar, Coben now proves we didn’t. An electric, stay-up-all night thriller that unfolds at a breakneck pace, Live Wire proves that Harlan Coben still has the ability to shock us anew. LIVE WIRE debuts at #1 on the New York Times, Wall Street Journal and Publishers Weekly bestseller lists. Read LIVE WIRE Chapter 1 through 3 (PDF, 175 KB).